For New Year our Dunedin based tech Chris goes to his home town, Gisborne to fire two incredible shows for Firework Professionals. On New Year’s Eve the team are busy with “Rhythm and Vines” and then on New Year’s day they’re out early again to rig and fire a tightly choreographed musical firework show on New Year’s evening. 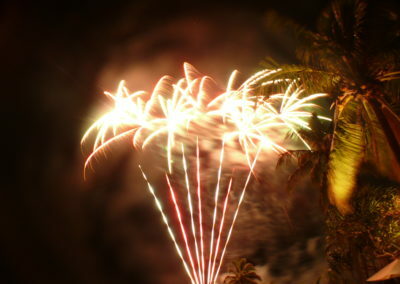 The New Year show is called “Fire in the Sky” and has been running each New Years day since 2002, sponsored by Walter Findlay Ltd, the Gisborne District Council, in association with Good Karma. Fired at the confluence of the Taruheru and Waimata Rivers the show is seen from all the three bridges around, and is a night to be remembered. Te Rangi and his team from Ngāti Kahungunu Iwi were trained by Anthony of Firework Professionals many years ago to perform firework shows for Matariki throughout the east coast area. Matariki has become a very significant Winter Festival with the fireworks, light shows and entertainment. The symbolism of the colours of fireworks has been wound into a poetic form by Te Rangi. Tony and Kerry are two other locals who have trained with Firework Professionals and fire the New Year’s Eve firework show on the pier in Napier. Their background in sound and lighting gives them great skills to manage and rig a tricky show exposed to the sea wind.